The Canary-winged Parakeet (Brotogeris versicolurus), also known as the White-winged Parakeet, is a small parrot native to the Amazon River basin from southeast Colombia to the River’s mouth in Brazil. 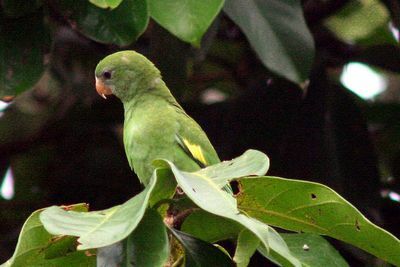 The hooked bill and green plumage are similar to a number of other introduced and escaped parrots and parakeets but the large white wing patches, most evident in flight, identify it. The Canary-winged Parakeet feeds mostly on seeds and fruit in its native habitat. Feral populations have adapted to take in blossoms and nectar. Feral birds will also come to bird feeders. The Canary-winged Parakeet usually finds a hole in a tree to nest in. It may also form a nesting tunnel in a dead palm frond. Caged birds have been released and the birds have established self sustaining populations in Lima, Peru, the Los Angeles, San Francisco, California and Miami, Florida areas of the United States, and in Puerto Rico. Poor indeed is the garden in which birds find no homes.